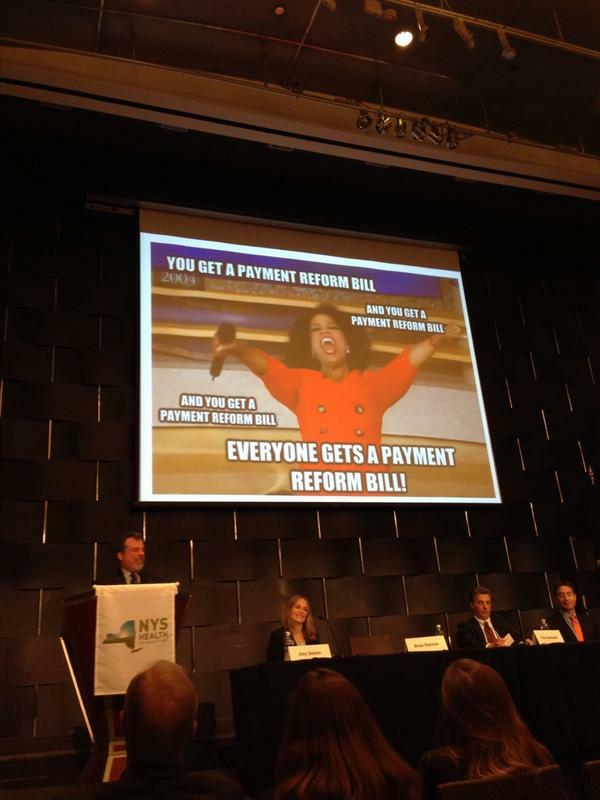 Last Thursday the New York State Health Foundation sponsored “Payment Reform: Expanding the Playing Field,” a conference on payment reform in health care. The main push is to lower the cost of health care—or at least slow the growth in costs–while increasing the value and quality of that care. Currently, the predominant form of payment in the health care sector is fee for service (FFS), where providers are paid for each element of care—doctor visits, tests, procedures, hospital stays, etc. Volume is rewarded over value–providers have a financial incentive to do more: the more they do, the more they get paid. The concern is that the FFS payment approach can lead to the overuse of unnecessary health care services and higher health care spending. Furthermore, performing unnecessary procedures can sometimes harm patients and does not result in improved quality or health. Payment reform focuses on shifting the way providers are paid to encourage quality over quantity. It should improve care–yet payment reform that balances quality care and lowered costs is difficult to implement. A major concern when shifting payment methods is under-service–where providers have an incentive do less. Patients may not get the care they need because providers are rewarded for saving money–which can lead to a disincentive to for proper care. Without quality metrics that take into the account each patient’s circumstances, shifting payment methods may actually result in a culture of less care and worse care. The Quality Council of the state’s State Innovation Model project is currently struggling with choosing quality measures that will produce the right results. Alan Weil, Editor-in-Chief of Health Affairs, delivered a thought-provoking keynote address—noting challenges and critical considerations of payment reform. While his talk covered a wide range of issues, he brought up several critical points in regards to the issue from the consumer/patient perspective. One challenge of payment reform is that it “threatens the core value of patient-centered care,” Weil states. This is because the metrics used to measure “value” are often simplified or dumbed down so that the reform becomes administratively feasible. In other words, care goals are created that make it easier to measure something, instead of focusing on whether the patient’s needs are truly being met. Weil also points out that it is necessary to look at payment reform in broader terms—if the focus is on wellness and prevention, the savings generated must be allocated to community-level interventions that better the overall social environment for consumers and address health inequities. For example, improving sub-standard housing and inadequate nutrition in communities can have a larger-scale impact on that population’s health outcomes–and further reduce health care costs. Overall, while payment reform is a critical tool for reforming the health care system, it is not the only tool—nor should it be. There is not one magic bullet solution and all solutions must remember to keep the patient’s health at the center–or else we are simply reforming for reform’s sake, not for the outcome of healthier people. You can check out tweets from the event by searching for the hashtag #payref14 or clicking here.